We are on a bit of a Datsun run at the moment but I couldn't help putting this up. 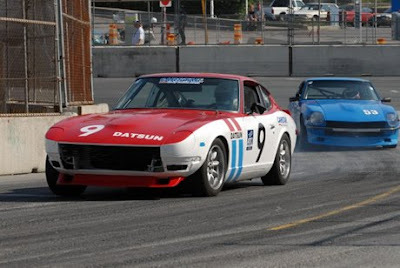 I love 240Z's and this is a great shot of two in full attack mode. They are a proper Sports Car and if you own one in NZ you won't have the ugly 5mph bumpers the US cars got in 1974. Polish designer Jacek Kolodziejczyk drew up a concept about a year ago. Check it out here. The main issue I have found when looking at buying one over the years is they rust out under the battery tray. Still one would be a great project car and with RB power it would be lethal. That looks like a BRE inspired s30 with Wanatabes (or similar... maybe Rota RB replicas). Behind it is another gorgeous s30 with a Xenon front air dam and what looks like a roll cage. Great comment Irish. Thank you for the info and links. The concept by Grid is very slick.